Weber Bahia upset Hebraica in a closely contested battle to secure their Final Four appearance. Lucio Redivo (183-G-94) scored 26 points to pace the Argentinean team. Hebraica dominated in the first half. They built a 36:22 halftime advantage. But Weber Bahia turned things around in the final quarter. They ignited a massive 30:13 rally to escape with a crucial win. Juan Pablo Vaulet (198-SF-96) delivered 13 points and 9 rebounds in the victory. Leandro Garcia Morales (186-G-80, college: Texas A&M, agency: Pro Sports) responded with 26 points for Hebraica. 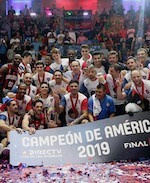 Ponce survived a double-overtime thriller versus San Lorenzo to secure Final Four birth. Hakim Warrick (206-F/C-82, college: Syracuse) stepped up with 35 points and 8 rebounds to pace the Puerto Rican powerhouse. Ponce led 39:27 at the interval. But San Lorenzo erupted for 53 points in the second half to force overtime. The teams scored 12 points each in the first extra period but Ponce stepped on the gas in the second overtime to get away with a vital win. Carlos Arroyo (188-PG-79, college: FIU, agency: Interperformances) delivered 32 points and 10 assists for the hosts. Nicolas Aguirre (188-PG-88) responded with 22 points, 15 assists and 10 rebounds for San Lorenzo.